VertaseFLI was actively involved with the remediation of the former scrap yard and tannery – from initial site investigations through to the completion of the site works. 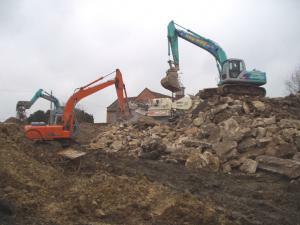 As Principal Contractor, VertaseFLI undertook the demolition and clearance of all site structures. During the project planning stage, VertaseFLI assessed the range of structures on site and addressed the safety issues associated with their demolition. Prior to demolition, Type 3 (Intrusive survey) asbestos surveys were undertaken to ensure that all asbestos bearing materials were identified and safely removed prior to commencing demolition works. In all, over 100 tonnes of bonded asbestos were transported to a licensed waste management facility for disposal. Due to its close proximity to an operational factory and public highway, the 25m tall brick chimney was demolished by hand. 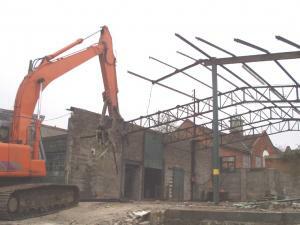 Demolition of this structure required the temporary closure of the public highway. The demolition programme was designed to maximise the amounts of recoverable / recyclable materials which were generated. In all, some 6,000m3 of secondary aggregate and over 300 tonnes of metal waste were recovered for reuse / recycling.